How Sweet is this? 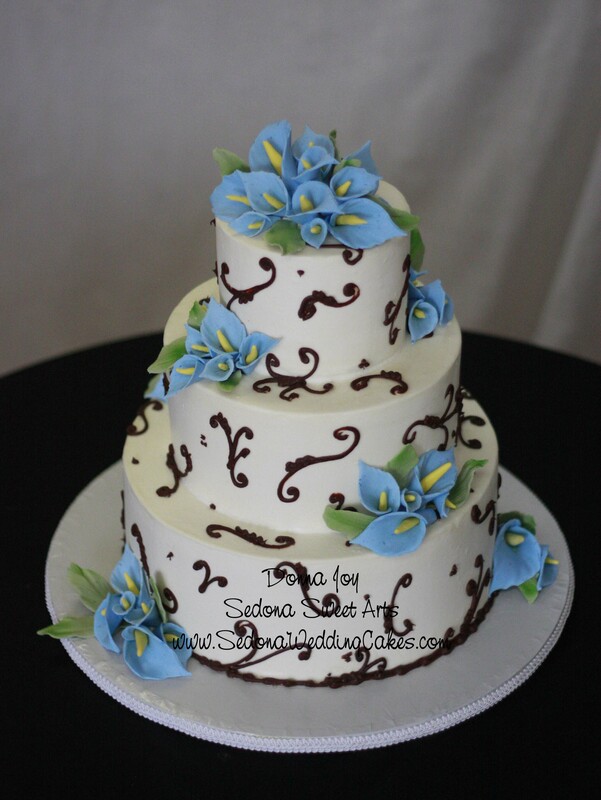 Smooth buttercream canvas is the cake, accented with yummy chocolate swirls then adorned with hand sculpted sugar Calla Lilies by Donna Joy of Sedona Sweet Arts. The design is a Donna Joy’s original created for a Bride getting married in beautiful Tlaquepaque Chapel in Sedona Arizona. Tlaquepaque unique flare of Old World charm creates a romantic location. The orginal design Tlaquepaque Calla Lilies was done with hand sculpted hand painted Flame Calla Lilies. Then to top it off the Bride had Donna Joy hide the cheesecakes under the sweet frosting. Changing the colors of the Calla lilies to fit the Wedding decor. Davids Bridal “Pool” colored Calla Lilies. Check out more of Sedona Sweet Arts work at their web site. Beautiful and delicious what more could you ask for! Gluten free mixes and baked items. So wonderful you won’t believe it’s gluten free. You a chocoholic? Best truffles bar none.